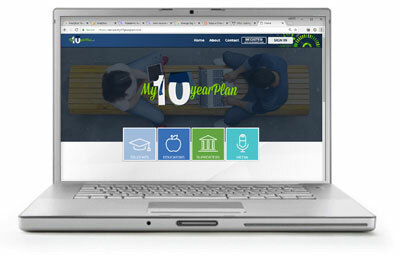 It starts with every student in the freshman course developing a 10-year plan using My10yearPlan.com®. For details click here. Then, in the 10th 11th and 12th grades, students update their work in the online area for the three follow-up modules Each follow-up module student workbook comes with access to the online Get Focused...Stay Focused!® area so students begin their work in their consumable workbook and then complete their work online in an interactive area of My10yearPlan.com® devoted to each of the 3 follow-up modules. This sophisticated hybrid-course provides the technological skills to assure students are ready to take advantage of technology advancements in learning they are sure to encounter in their postsecondary work.